“Tlatelolco Disproved” is both a choreographed urban landscape and a portrait of a community. Documented with photographs and video it was created with the collaboration of over 100 neighbors of the Chihuahua building. Pani´s dream was short-lived though, only 4 years after its completion and 10 days before the Olympics´ opening ceremony in 1968 the government massacred hundreds of students during a peaceful student protest in-front of Tlatelolco´s Chihuahua Building. Tragedy was to strike again less than two decades later when hundreds more were killed after the Nuevo Leon building collapsed in the 1985 earthquake. Initially drawn to Tlatelolco by its size, its graphic modernist architecture, but also by is deterioration and bustling activity, I would visit and photograph it often. I ride my bike through it and occasionaly get lost there on night bicycle rides with my friends. When you stand at the edge of the Plaza de las Tres Culturas (3 cultures square) you can see the colonial church of Santiago Tlatelolco next to the pre-Colombian ruins of the Tlatelolcas surrounded by the towering Pani buildings; a surreal experience. One feels claustrophobic and agoraphobic at the same time. Trapped and exposed; a target, like those many students must have felt when they tried to flee the volley of bullets in 68. In an attempt to capture a portrait of a people and their place, my project began with a huge stitched photograph of the Chihuahua building. An urban landscape that spoke of a community who have adapted to the memory of tragedy, and a building that bares the scars of it. The photograph is a composite of 4 high-resolution photographs. Printed on a grand scale it has sufficient resolution to permit the viewer to see as a complete structure or to get close and look into each apartment window. The changes to Mario Pani´s building can be appreciated in great detail in this print: The stripped facade with skeletal reinforcements, exposed rectangular windows now unframed by the original panels, cracks, cables, missing chunks of concrete, satellite dishes fixed randomly wherever a good reception is to be had. Looking to emulate a similar set of circumstances to those that made Tlatelolco what it is today, I felt it important that this landscape be created by permitting chance, environment and the collective human spirit as a part of its process. I wanted to plan a portrait that would be, in part, a result of the unpredictability of circumstance. I created a set of abstract designs on paper making reference to historical events and translated these into light pixels representing each window on the face of the Chihuahua building. 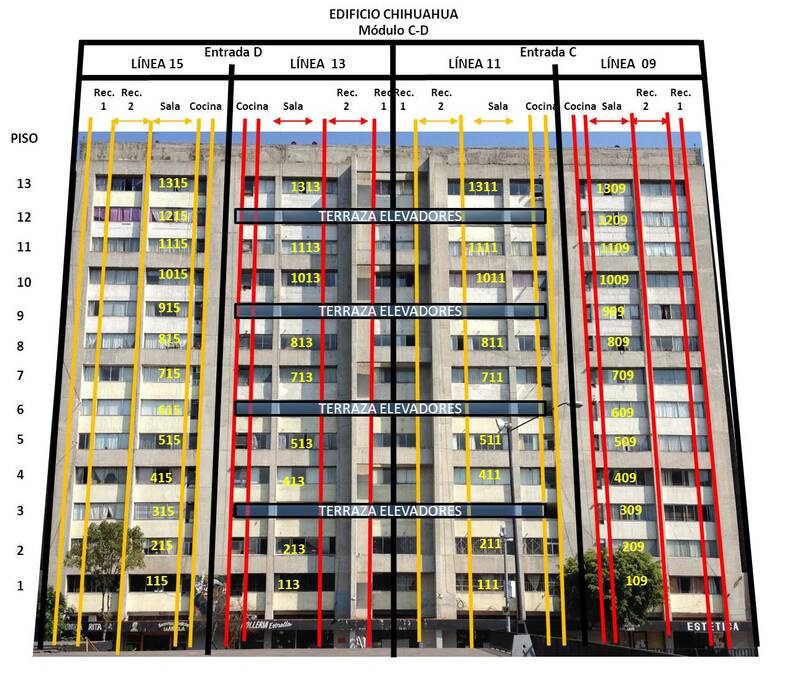 We invited neighbors from the more than 90 apartments to participate in this experiment. The idea was meticulously planned: Each apartment received individual scripts indicating when to turn which lights on and off throughout the apartment. The changes were every 15 seconds for 23 minutes making a total of 92 photographs. With no rehearsal and little idea why they were doing this the neighbors collectively created a piece which bore some similarity to what was planned but took on a life of its own. I was wrong to imagine that suspicion, fear, apathy and selfishness would limit participation. I was concerned that the project might not reach a critical mass and therefore never realize visual coherence. In the end more than 90% of the building participated in a communal spirit, in blind faith, not knowing really what they were doing or why and not being able to see the result as it was being made. Tlatelolco could not be explained, it could not be planned, it could not be proved.